This has been a banner year for diversity. The Spring 2017 presentations showed us that calls for inclusivity on the runway did not fall on deaf ears. New York Fashion Week was the most body positive in history; catwalks across the Western world featured more models of color than ever before. Red carpet mainstay Christian Siriano brought plus-size models into the high-fashion fold. Chromat featured four transgender models (along with curvy and disabled models) in its biannual celebration of unconventional beauty and architectural swimwear. Kanye West cast hundreds of women of color for Yeezy Season 4. Designers from Bottega Veneta to Tome to Ralph Lauren showed that style and swagger know no age. That said, the total percentage of models of color castings on the runways barely broke 25 percent. For the plus-size community, 0.54 percent representation counted as a triumph, in spite of the fact that women over size 12 make up over 67 percent of the U.S. population. (And no plus-size models walked runways outside of New York.) Backstage, only 46 of the 150 designers who made the CFDA-sponsored schedule were nonwhite, of which only eight were black. 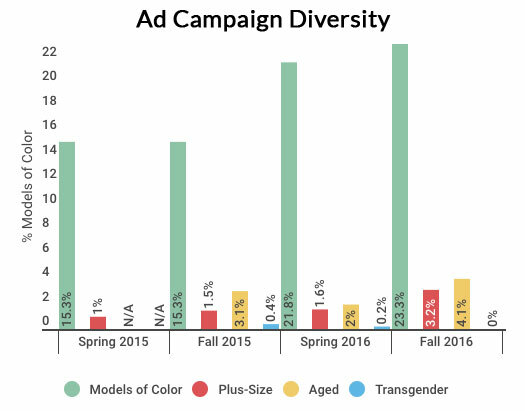 Given these findings, we expected the Fall 2016 print ads to tell a similar story of diversity gains in the face of ongoing discrimination. Designers tend to think inside the box when it comes to global campaigns since there’s ostensibly more at stake: “Even for those creatives who want to cast diverse models, budgets only enable the execution of one global campaign — and white models, supposedly proven to attract consumers, reduce risk,” explained Dr. Ben Barry, assistant professor of equity, diversity and inclusion at Ryerson University and author of one of the first studies on how size, age and race of models affects purchasing decisions in the category of fashion. And now to see if marketers stuck with that precept. 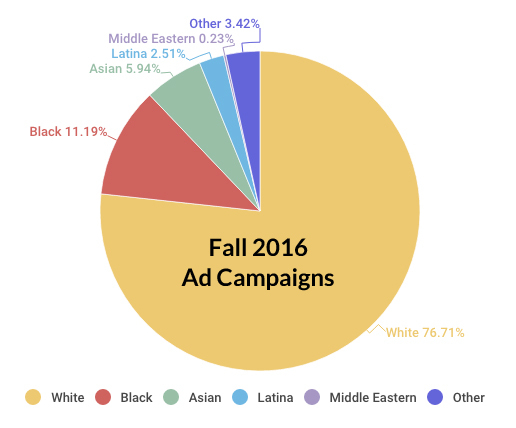 The Fall 2016 list of whitewashed campaigns is, unsurprisingly, populated with labels we’ve called out before. Chloe, Valentino and Moschino all cast four women in their campaigns with nary a model of color in sight. Last season, Chloe broke its decades-spanning white streak when it cast Brazilian beauty Ari Westphal in its Spring 2016 ready-to-wear campaign. Prior to that, the French label had not cast a model of color in a ready-to-wear campaign since 2001, when former Creative Director Stella McCartney was at the helm. Unfortunately, it’s back to business as usual chez Chloe. Conversely, Rihanna’s Fenty x Puma led the diversity charge with three out of three nonwhite campaign stars. In addition, several luxury brands — Chanel Eyewear, Balenciaga, Alexander McQueen, Loewe, Karl Lagerfeld — chose models of color to single–handedly front their campaigns. As did — wait for it — Victoria’s Secret, which only just hired its first black PINK spokesmodel this year. For Fall 2016, the controversial lingerie giant showcased Fantasy Bra-wearer Jasmine Tookes in its Sport collection campaign. The rest of the top 13 each scored four campaigns. This set includes Freja Beha Erichsen, Karlie Kloss, Rianne van Rompaey, Stella Tennant, Sasha Pivovarova and androgynous Dominican beauty Dilone. The 22-year-old Long Island native first took the fashion world by storm when she walked in Bottega Veneta’s Fall 2016 Menswear show. While it’s encouraging to see fashion embracing gender fluidity, we’d prefer to see androgynous models like Dilone posing with transgender models rather than in their stead (but more on that later). Meanwhile, the number of plus-size models of color booked rose from zero (for Spring 2016) to five. (Hooray?) Lane Bryant featured Precious’ Gabourey Sidibe and Orange Is the New Black’s Danielle Brooks. Addition Elle shot Kwao alongside Lebanese-American fashion blogger, model and designer Nadia Aboulhosn, and model-slash-Kylie Jenner BFF Jordyn Woods. You’ll notice that both redeeming campaigns were for mass-market plus-size labels. In fact, in 12 out of the 14 total appearances, it was mass-market plus-size brands that, by default, cast women over size 12. The outlier was European fashion chain Lindex (an H&M equivalent). 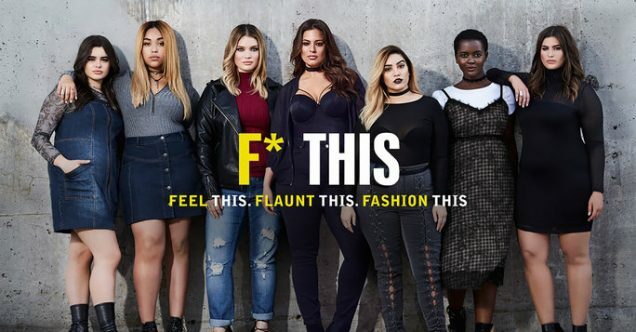 Ashley Graham and Candice Huffine posed for the retailer’s Fall Fashion Heroes campaign, heralding the elimination of its so-called “Generous” plus-size line and the expansion of its typical sizing range. 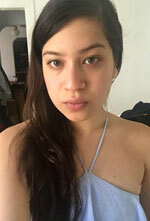 Unfortunately, better-known brands that have championed body diversity in the past — Marc Jacobs, H&M — did not take up the mantle this time around. In October 2015, Reina Lewis, professor of cultural studies at London College of Fashion, told The Business of Fashion, “Fashion isn’t about selling real life … Even something ostensibly real, like normcore, is only cool when it’s shown on slim, youthful bodies — not on 50-year-olds.” And yet, in perhaps the most encouraging development of the Fall 2016 ad season, 18 older models made the cut — comprising 4.1 percent of all castings. This is a marked increase from the Spring 2016 spreads, which saw only nine aged model castings, though not on par with the Fall 2015 fashion ads, which featured 22 women age 50 and above. It’s also worth noting that, of the 18 appearances, four were older models of color. For the third season running, Marc Jacobs was responsible for the majority of older model castings. In his Fall 2016 ads, he extolled the virtues of Courtney Love, Genesis P-Orridge, Sissy Spacek, Kembra Pfahler, Susan Sarandon and Keiji Haino (along with a certain contested “supermodel” who just turned 21). Elsewhere in the luxury world, Miu Miu’s Alasdair McLellan-lensed, high society-themed campaign shined the spotlight on Jeny Howorth (mother to Georgia, muse to Helmut Lang). Meanwhile, Kim Gordon lent her ageless cool to Kenzo, Pat Cleveland posed for Neiman Marcus and Yasmin Le Bon appeared in both Debenhams and Sisley’s fall campaigns. Tatjana Patitz reprised her role as the face of Triangle and fashion icon and nonagenarian Iris Apfel posed for Aigner. And then there’s 85-year-old Carmen Dell’Orefice — who modeled for Salvador Dali at age 13 and landed her first Vogue cover two years later — who graced Philipp Plein, Airfield and H&M with her striking cheekbones and silver mane. It seems labels are increasingly aware of A.T. Kearney’s findings that people over 60 make up the fastest growing group of consumers in the world and account for 60 percent of all consumer spending. Mirroring campaign casting trends, women age 50 and above turned up on more Spring 2017 runways than in any other season in recent memory. Transgender models are traditionally the least represented group in fashion ad campaigns. True, they make up a smaller sector of the general population than the aforementioned groups and therefore a smaller ratio of transgender models to cisgender models is somewhat expected. 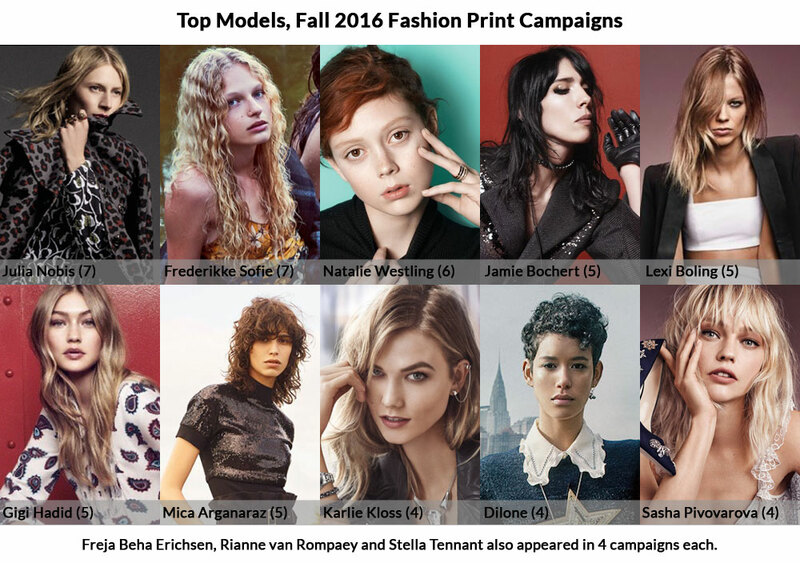 Transgender models were completely absent from the Fall 2016 campaigns, however. For Spring 2016, Marc Jacobs was the only designer to shoot a transgender model (Lana Wachowski). In Fall 2015, three transgender models made the cut, all of whom were white. One season earlier (Spring 2015), transgender models were again overlooked. That said, Hari Nef recently posed for Mansur Gavriel, a casting that did not fall within the confines of our data as it took place this summer. Last week, eco- and politically-conscious It brand Reformation revealed Andreja Pejic as the face of its holiday line, which, again, does not qualify as a fall campaign, but is nevertheless encouraging. The fact remains that in a year that’s seen more transgender models walk the runways than any in recent history; one in which gender-neutral pronoun “they” was named 2015’s Word of the Year during the American Dialect Society’s annual meeting; a year wherein more transgender central characters will appear on our TV screens than ever before, it’s disappointing that the images shown by fall’s fashion billboards and magazines will not reflect this progress. And critics though we may be, so are we. 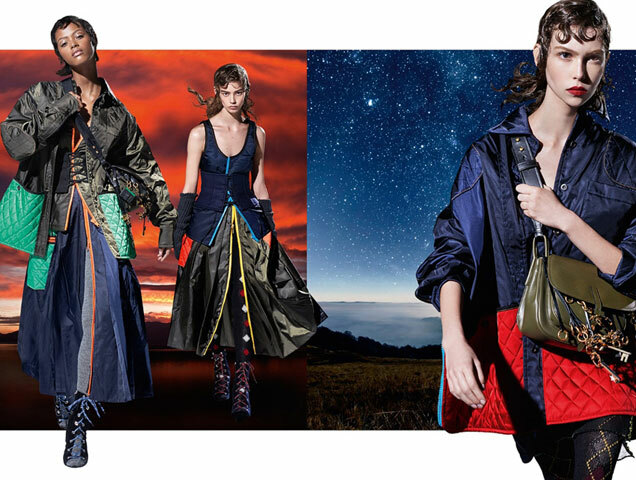 The main thing to take away from these findings is not, “Shame on you, Chloe and Valentino,” but what is it that we, as educated consumers, can do to promote further change. With additional reporting from Mark E.
For this report, the term “model” includes celebrities and influencers featured in campaigns. Models of color were categorized as those who appear to be nonwhite or of mixed backgrounds. Models included in the Latina category are classified as nonwhite Latinas that do not appear to be strongly Afro-Latin. Models included in the Other category are classified as nonwhite models of mixed or unidentified backgrounds. *Note: At time of publishing, Bella and Gigi Hadid, who are of Dutch and Palestinian descent, were categorized as white for this report. To more accurately reflect their mixed-race heritage, we’ve updated their categorization to nonwhite and amended our data. Our new racial diversity reading for Fall 2016 is 25.7%.